A few months ago, I was blown away by AJ Fernandez’s San Lotano Connecticut cigar. I ended up ranking this cigar #8 for 2010. This cigar proved to me that a Connecticut Shade wrapper can be something special. I’ve now found a second cigar to join this club – the El Primer Mundo Connecticut Shade. If you are looking for a smoke that is not too heavy, yet packed with flavor – this cigar is for you. El Primer Mundo is a company based out of Atlanta, Georgia by Sean Williams. To blend his cigars, Williams is working with the legendary Nestor Plasencia and his family -getting the tobacco from the Plasencia farms and using the Plasencia family to hand-roll the cigars. For the purposes of this review, I will focus on the Robusto. For this smoke, I punched a hole into the cap and then gave the foot a nice toast with the lighter. One thing that I loved with the San Lotano Connecticut is how it gave me flavors right at the start – and the great news is that the same can be said for the El Primer Mundo Connecticut Shade. Immediately, I started getting notes of cinnamon and wood. The cigar definitely had a mild start, but that was not unexpected. The cinnamon notes are not overpowering, but very smooth. About 1/3 of the way through the smoke, a sweetness begins to emerges from the cinnamon. The sweetness has notes of cherry – again not overpowering. I also detected some of the cream that were advertised with this cigar – again very smooth. At the halfway point, a wonderful cedar spice layers over the sweet notes. This spice stays with the cigar for the duration. The finish to this cigar has a nice kick – something that is always enjoyable to me with a Connecticut shade cigar. The finish to the stick was a little soft, but it was cool (and not hot). Smoothness is a key characteristic of this cigar – and combined with the wonderful flavors it makes for a very pleasant cigar experience. The strength of this cigar isn’t going to overpower you as I would definitely categorize this a Mild to Medium for the majority of this smoke (mild at the very beginning, medium at the very end). The body of this cigar is actually closer to the medium range as the flavor notes are very pronounced. The burn was flawless throughout this smoke – burned like a champ the whole way through. The draw was good too. An Indie (boutique) cigar needs to bring something special to the table. Clearly, Sean Williams and his brand have succeeded with doing this with the El Primer Mundo Connecticut Shade. 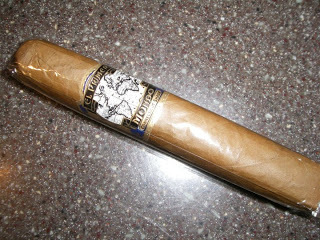 I’m hoping to see this cigar in more retail stores in 2011. I had the pleasure to meet Sean recently at the Seattle Cigar Expo and again at Fairhaven smoke shop in Bellingham Wa. I came away with a variety of his El Primer Mundo cigars. Your review is right on the mark. The Connecticut is one fine cigar, one I especially like to smoke in the early morning with coffee. I appreciated the consistency of flavours down to the nub. This will definitely become a regular in my smoking life.